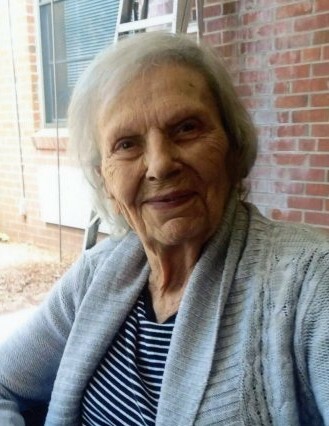 Mrs. Kathryn Powell, age 90, of Marion, passed away at Autumn Care of Marion on Sunday, October 14, 2018. Kathryn was born in McDowell County on July 3, 1928, to the late Clophas Franklin Odom and Essie Mae Mille Odom. She was a longtime member of Fairview Freewill Baptist Church, and was a devout Christian whose strong faith was a testament to many. Kathryn valued life, and had a true passion for flowers. She loved taking walks, but especially prized her grandchildren. Kathryn enjoyed playing rummy, and was always willing to play another game. Left behind to cherish her memory is her son, Frank McCoyle and wife Janice of Marion; two grandsons, Bruce McCoyle and Fiancé Barbara Tucker of Marion, and Barry McCoyle of Marion; and two great-grandaughters, Faith Tucker and Jayme Tucker. A celebration of her life will be held on Wednesday, October 17, 2018 at 2:00 p.m. at Fairview Freewill Baptist Church with Rev Wayne Miller officiating. The family will receive friends one hour prior to the service from 1:00 p.m. to 2:00 p.m. at the church. Burial will follow in the church cemetery. In lieu of flowers, the family asks that memorials be made to the American Cancer Society at P.O. Box 22478, Oklahoma City, OK 73123.